Most of the scientific establishment predict that the North Pole will be free of ice around the middle of this century. As Peter Wadhams, the world's leading expert on sea ice, demonstrates in this book, even this assessment of the future is optimistic. Wadhams has visited the Polar Regions more often than any other living scientist - 50 times since he was on the first ship to circumnavigate the Americas in 1970 - and has a uniquely authoritative perspective on the changes they have undergone and where those changes will lead. 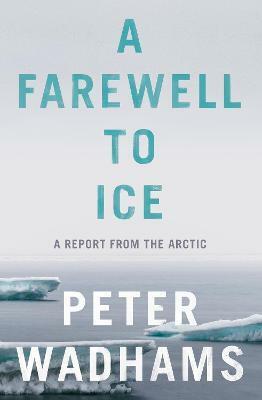 From his observations and the latest scientific research, he describes how dramatically sea ice has diminished over the past three decades, to the point at which, by the time this book is published, the Arctic may be free of ice for the first time in 10,000 years. Wadhams shows how sea ice is the 'canary in the mine' of planetary climate change. He describes how it forms and the vital role it plays in reflecting solar heat back into space and providing an 'air conditioning' system for the planet. He shows how a series of rapid feedbacks in the Arctic region are accelerating change there more rapidly than almost all scientists - and political authorities - have previously realised, and the dangers of further acceleration are very real. A Farewell to Ice is a report from the frontline of planetary change in the Arctic and Antarctic by a leading authority, presenting incontrovertible scientific data, but always in clear language which the layman can easily understand. It is one of the most important books published in recent years about the existential challenge which human civilization now faces. Peter Wadhams is the UK's most experienced sea ice scientist. He was Director of the Scott Polar Institute in Cambridge from 1987 to 1992 and Professor of Ocean Physics at Cambridge from 1992 to 2015. He has made more than 50 expeditions to both polar regions, working from ice camps, icebreakers, aircraft, and, uniquely, Royal Navy submarines (making six submerged voyages to the North Pole). His research group in Cambridge has been the only UK group with the capacity to carry out field work on sea ice. He has also held visiting professorships at the National Institute of Polar Research, Tokyo, the US Naval Postgraduate School, Monterey, the University of Washington, Seattle and the Scripps Institution of Oceanography, La Jolla. Peter Wadhams has been awarded the W.S. Bruce Prize of the Royal Society of Edinburgh (1977), the UK Polar Medal (1987) and the Italgas Prize for Environmental Sciences (1990). He is an Associate Professor at the Laboratoire d'Oceanographie de Villefranche, and a Professor at the Universita Politecnica delle Marche, Ancona. He is also a Fellow of the Royal Geographical Society and a Member of the Finnish Academy.